African violets have an ill deserved reputation as being difficult plants to grow. African violets are actually very easy to grow if you follow some basic rules and with care you can get them to flower almost year around. Keep your African violet in the four inch pot it came in. Putting African violets into larger pots will make them grow weedy and encourage leaf growth instead of flower growth. It just won’t bloom well in a large pot. Check the soil. If you bought your African violet, be aware they are often planted in peat moss instead of high quality potting soil. These flowers need to be in a rich soil to flower. Water your violet from the bottom. Watering from the top inevitably gets water on the leaves, leading to yellow spots. African violets need to be watered from the bottom to ensure the roots get adequate water. Place the pot in a shallow tray or saucer of water and let it sit there for about thirty minutes. Empty out the water. 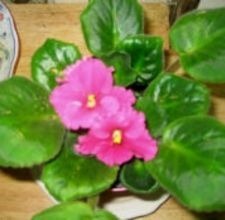 You don’t want the plant to sit in water because that will cause the roots to rot and eventually, the African violet will die. Let the soil dry out in between waterings. Add plant food specifically formulated for African violets to the water. Follow the directions on the bottle. Usually just a drop or two is all you need. A properly fed African violet will produce more flowers. Place the plant where it will get filtered, not direct, sunlight. Because of their compact size, many people place them on sunny windowsills where they dry out too fast and refuse to bloom. Prune suckers as soon as they appear. African violets put out suckers to propagate new plants, but if you don’t remove them the mother plant will become misshapen and won’t flower. The suckers can be removed carefully with small scissors or tweezers and repotted to grow new plants. Place the sucker in a four inch pot with good potting soil. Water it well and enclose the whole pot in a zipper bag. Use a straw or stick to prop the bag up so it’s not touching the baby plant and leave it out of direct sunlight for about two months. When you see vigorous growth, remove the bag and about two months later it will be ready to start producing flowers. Be patient and don’t give up on your African violet if all the flowers disappear. These little plants are dormant for about three months out of the year and produce no flowers. Keep watering and feeding it and the flowers will reappear once it’s had a rest. 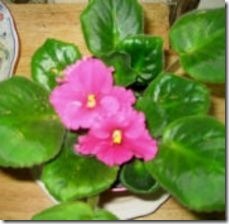 « Why Are African Violet Leaves Turning Brown?